Since my last Pav Bhaji post, I must confess to having pigged out on ‘real’ Pav Bhaji many times in India now. I am officially an addict and can’t get enough of this spicy potato mash-up. However, there is one other dish that I feel trumps Pav Bhaji. Let me introduce you to the very special, the very magical, the very glorious Masala Pav. When we were in Mumbai last December, I tried a tiny tiny bite from my brother-in-law’s plate, and it shook my world. I would have easily finished his portion but I was trying (very hard) to be nice, so I let it go. That spicy, buttery soft mouth sensation has been haunting me ever since and after much trial and error, I finally worked out how it’s prepared. 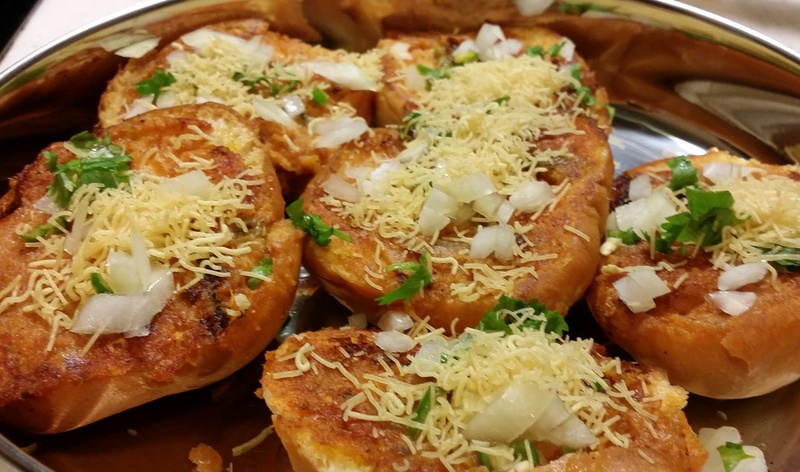 So here’s introducing you to my favourite dish in the world – Masala Pav. No measurements here, you need to work that out based on the amount of left over bhaji you have. Heat a large flat pan and spray generously with oil spray. Spread the bhaji on one side of the bread. I like to have it in a medium-thick layer. Place butter slices over the bhaji, place bread bhaji side down on the pan. Make sure the pan in on a medium flame. Using a spatula, gently press the bread down. After 4 to 5 minutes, the butter should have melted and the bhaji would have browned nicely, forming a crust. Flip the bread slices and cook on the other side for a minute or two until golden and crusty. Remove and place on a serving plate. Top with sev, chopped onions, chilies and coriander. Squeeze lime on top. Enjoy!